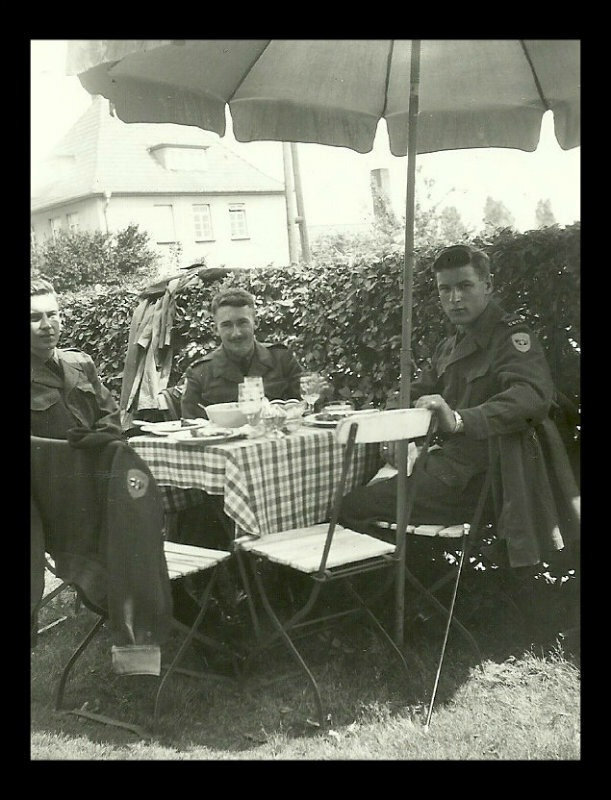 Recently more pictures of the Hannover Garrison of the 27CIB, BAOR have been provided by 2/Lt Ken Ridge, Queen's Own Rifles of Canada. In 1952, 74 2/LT's were selected from the University Contingents of the COTC in Canada for service with 27CIB based in Hannover, Germany. This plan, the 1st of its kind was initiated by the Minister of National Defence, The Hon Brooke Claxton of the St. Laurent Government. Pictures courtesy Ken Ridge, Oshawa, Ont. First off, give my regards to Ken for the great photographs. Please keep them coming. Second, about the details you've provided. Were these 2Lt's permanently assigned to the Brigade or was it just for the summer in lieu of the normal summer COTC training? Were all of the 2Lt's infantry or were all arms and corps represented? Can you identify the cap badges of the four officers in your picture? You identify yourself as former artillery, but you're not wearing an artillery officer's accoutrements in the photograph. Did you re-muster at some point? 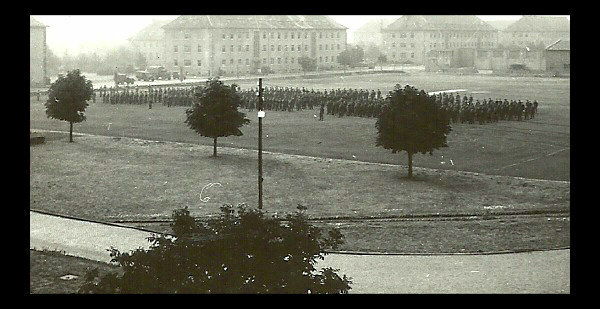 Thanks for your interest regarding the deployment of COTC candidates to the 27CIB BAOR in Hannover, Germany in 1952. The deployments were made during the early spring and summer and we were sent over in small groups on different ships. The duration of our service was to be for the summer only as some would have been returning to university. We were not told about our postings until we arrived at Bde HQ. I believe that most of the postings would have been to 1st Cdn Rifle Bn, 1st Cdn Inf Bn and a small number to 1st Cdn Highland Bn because of the cost of kit. The recruitment of personnel in Canada (not COTC) for the 27th was done from 15 different reserve/militia infantry regiments. each of which retained their own unit identity i.e. unit cap badges etc. The four 2/Lt's in the picture were all assigned to the 1st Cdn Rifle Bn, Ridge was QOR of Canada in the support coy, Williams and myself were with the RHLI rifle companies, and the unknown French 2/Lt I think with Victoria Rifles from Montreal. I am still wearing my COTC cap badge because I was among the last group of arrivals in Hannover and had not been issued with my RHLI kit. While most of the 2/Lts would have been in the infantry there were some (engineering, medical, & dental students) who were posted to the applicable units outside of Hannover. It is possible that some 2/Lts may have stayed beyond the summer depending on their future commitments. In my case I was going to a secondary school teaching job . There was an expectation that COTC graduates would continue their military service in the regular or reserve force. I joined a reserve Regiment, 21 Field Anti Tank Regiment which subsequently became 21 Fd Artillery Regt(M). Ken Ridge joined the QOR's of Canada Regular Force and served for a year before entering secondary school teaching. Eventually we both became headmasters in our schools and were able to renew our friendship at Headmaster conferences in Toronto, Ottawa, and Montreal. I note that you served with the RCR in London and Gagetown. During WW2, I had four 1st cousins who were with the RCR in London, ON, England, and Italy. I heard a lot about the RCR. LOL. More of Ken's pictures will follow. Thanks for letting me ask you the questions. I hope I'm not being too troubling. I have a couple of others if you don't mind. Wouldn't those 2Lt's who were to return to University in the fall still technically be Officer Cadets? I was under the impression, and I'll be the first to admit that it could very well be the wrong impression, that COTC candidates weren't commissioned until graduation? Back in the day, were COTC candidates trained during the summer with the Regular Force candidates? In three Phases as it was done starting in the 50's? What Brooke Claxton initiated, and what you were a part of, later became quite routine. It was common for military college cadets destined for the Army to spend one summer with the NATO brigade. I don't know if it was continued with the COTC again, those damn mil-coll types got everything. I always enjoy learning something new about the Army. Thanks for that. Your further questions are welcome and I will do my best to answer them. In the selection procedure for overseas duty one had to have completed two years of COTC training in order to qualify for "Special duty" with the 27CIB in Germany. All 74 candidates were no longer officer cadets; they were qualified 2/Lts and would not return as Officer Cadets. When I returned to Canada in 1952, I was qualified as a Lieutenant according to my Service Records. I do not recall the COTC being mixed with Regular Force Officer Cadets during our summer training at Valcartier and Borden. If they were there they were trained separately. I am not aware that military college cadets had to spend a summer with the NATO Bde in Germany. My son attended the Royal Military College in Kingston from 1975 -79 and did not have any oversea duty. He graduated with a Queen's commission and a Civil Engineering degree and subsequently had to serve in the Regular Force for four years to pay for his education. Feel free to post any further questions. Another couple of gems to add to the definitive history of 27 CIB contained in this site. Congratulations on your recent promotion and welcome to the Officers' Mess. The disadvantage is , as you will remember from your early days, is that you are now junior member present on all formal occasions and have the honourable title of Mr Vice (there are no Subalterns to carry out the task). All Pictures courtesy Ken Ridge, Oshawa, Ont. Good to hear from you and thank you for your acknowledgement of my recent promotion as well as your welcome to the Officer's Mess. It's a great honour to qualify for a promotion in the BAOR forum. Will order a round of flaming drambuies at the next mess dinner. Yes, you were wise to remind me of my duties as Mr. Vice. You can count on me to adhere to the niceties of mess etiquette. Gentlemen, the Queen , our Captain General. Excellent photographs Bob, and welcome (once again) to the Officers Mess. The Queen, our Captain General - Slainte! Aug 1952. 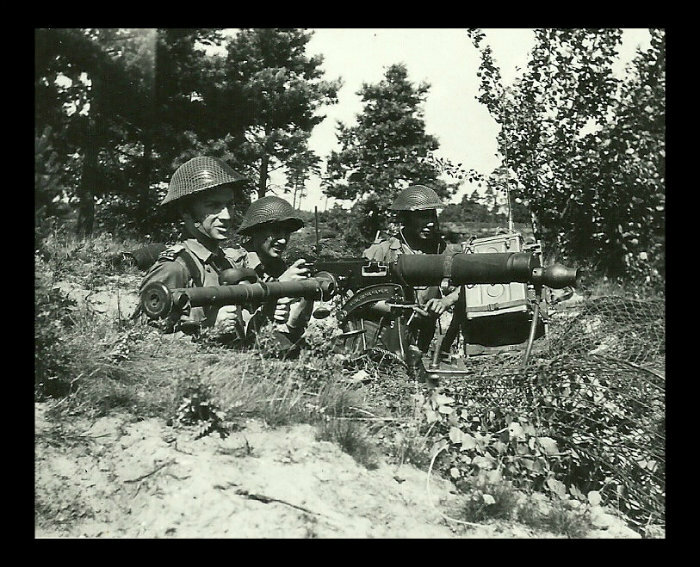 2/Lt Ken Ridge QOR, SP Coy on left holding what may be a range finder?, others unknown. Vickars Machine Gun, live firing QOR Support Coy, personnel not known. "fraulein, drei bier nachmals, bitte ! More great photos. Do you recall if the individual barrack blocks were named? I sent my last message before I had seen your latest Ken Ridge photographs. I could look at these for hours and still find something new in them each time. In the first photo, I noticed that Ken is wearing the Canadian pattern helmet scrim which is black on one half and green on the other. The gunner is wearing the invasion pattern Mk III helmet while Ken and the far soldier are wearing the Mk II. That also looks like a hoofing great radio to have to carry. Thank God for transistors and circuit boards. In the second photo the troops are wearing the standard Canadian field wear for the 20-years following the Second World War: coveralls. In all the colours of the military rainbow. I noticed that the '37 pattern webbing is polished black in true Rifle fashion. And canvas ammunition belts? Positively medieval. In the last photograph I noticed your silver tipped officer's cane. Perfect for returning salutes with. Are the COTC tabs on your epaulettes (which Ken is also wearing in the first photo) worn with the Regimental flashes on your BD blouse? I can't say this enough. Great photographs and thanks to you and Ken for providing them. Like Dan I have run out of superlatives to describe your photos. The Putlos ones brought back particular, memories I was at school as you know at Ploen, 30 miles away. We had the occasional trip to the seaside as a reward for good behaviour though realistically we had the facilities we needed in the vast school grounds. Was/Is it a tradition for the Canadian Army to name individual barrack blocks as well as the actual Barracks? 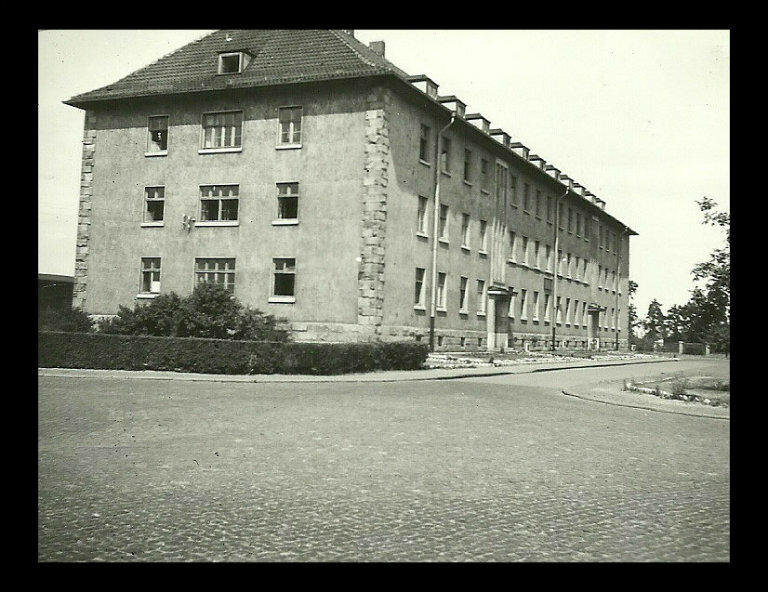 This was certainly the case at Maple Leaf Barracks Aurich which was home to Canadian Divisional/Brigade HQs and some other units under command in 1945/46. Visited the Vingt Doos HQ in Quebec a few years back and their Blocks were also named after Campaigns/Battle Honours involving the Regiment. A quick memory of the QOR's in Currie Barracks in Calgary 1962 Dec.
RSM of the QOR's depot and some WO 2's are walking down the main road to the main gate. A young Air Man RCAF in Great Coat, Forage Cap and BROWN GLOVES (Army officers only). I'm behind the Air Man thinking how come brown gloves? RSM starts to take Pace Stick from right hand to left hand in prep. for saluting what he thinks is an RCAF Officer because of brown gloves. I raise hand and get as far as saying Si.. and he he salutes. Air Man looks startled. RSM realizes mistake. RSM gives almight roar of hell (He was ex British 8th Army). Air Man takes off in a real infantry fast panic run. Me I just kept straight face and carried on. RSM shouts his thoughts on RCAF and the parentage to the RCAF lad. And mentioning about placing his pace stick so far up the RCAF rear end, that he'll think he has a mouth full of tooth picks. Another interesting day in Currie Barracks. Thanks again for your very perceptive questions about the outrageous assortment of kit which was issued to the 27CIB. You are much more observant than I am or was. I'm sure that the clothing and webbing was gathered up from every quartermaster store in the Canadian army and possibly, as well, from the Salvation Army Thrift Stores. Shirts and coveralls in particular never fitted or matched and if you commented about it they would always say you're lucky to get anything. Ken Ridge always said that the regulars in the 27th didn't like us (COTC) but Ken had the misfortune to be posted to the QOR of Canada (Toronto) much like your Regiment (RCR) but only worse. "the RCR refuse to fight unless their brass is shining bright" LOL. The QOR's were top heavy in the upper echelon of the 27th; Lt Col John Delemere, our Bn Comd, was QOR in WW2 as was the Adj, who I should add was the disciplinarian of the Jr. Officers. I never felt what Ken felt but I was luckier being posted to the RHLI where I was well treated by all concerned. Dan, you will know that Toronto, historically, looks down its nose at Hamilton. A good joke was circulating in the hockey world this past winter. It goes like this, "Hamilton will never get an NHL hockey team because if it does then Toronto will want one." yuc yuc. I'm sure I do not have to explain the subtlety to you. Yes, we all had to wear the COTC flashes along with the our battalion flashes so that everyone could recognize us as Officer Cadets. But we were no longer Officer Cadets , we were all enrolled for Special Duty with the 27th as qualified 2/Lt's. Our Records of Service showed that. That would have been the Adj's doing. In regard to your question about identifiable names for each barrack block, I cannot remember hearing them referred to by any other names than the London/Edinburgh Barracks. It's an interesting question because here in Canada it's quite common to use special military names for barrack blocks and streets on the bases. Glad to hear that you are pleased with the photographs; I will pass that along to Ken who does not use a computer. Yes , I remember your telling me about the close proximity of your school to the base at Putlos on the Baltic. Was it to Travemunde that you were taken to for good class behaviour? We were not permitted to go there but then we never got any leaves. at Putlos. It is the practice in Canada to name individual army blocks with significant personal names of military heros and place names of significant historic battles. For example, I remember seeing the name Balaclava on a barrack block somewhere . I had to do some research and found it was a famous battle field site (Charge of the Light Brigade)during the Crimean War. We also have a town in Ontario named Ladysmith which is from the Boer War. Sometime ago you told me about the origin of the word Squaddie being related to a similar word for an Indian private. We have a town called Lucknow about 15km from where I live which is related to a city by the same name in India. The nick name for the town is the "Sepoy Town". Apparently the Sepoys were Indian troops loyal to the British Crown during the Indian Mutiny ( e.g. General Dyer's campaign to put down the mutiny at Amritsar). The reason the name was chosen when the village was incorporated was because a local resident of Scottish ancestry on the village council had a strong interest in England's involvement in India. Many of the streets in the village have Indian names. I believe that every city and town in Canada has a street and/or park named after Queen Victoria. I thought that you would be interested in Dan's question about specific historic names for individual barrack blocks at the Hannover garrison. It seems plausible but I don't recall any. Glad to hear that you are enjoying the pictures. Funny story you told about the RSM with the pace stick and saluting. When we were posted to the Rifle Battalion at Hannover in '52 we were all issued with sticks which were referred to by various names. We thought that this practice was an anachronism that was long gone. Not so. The RSM got all of us out on the parade square one evening for stick drill. As you know there are many moves involved when one has to salute when carrying a stick. A few of the 2/Lt's never managed to acquire or make those moves gracefully. LOL If they happened to see the Adj coming down the street ahead of them they would move to the other side of the road so that they would not have to salute the SOB. Why trolling through the WWW as is often my wont, I came across yet another picture of Edinburgh Barracks courtesy of "The Powder Horn" a Queen's Own Rifle source in their Fall 2012/Winter 2013 paper. 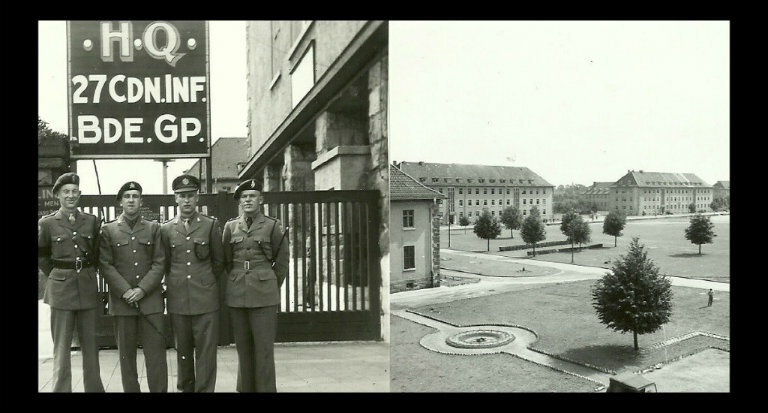 Quoting from the page, "Upon arrival Hannover ,1CRB and 1CHB were quartered in a former German artillery housing now renamed Edinburgh Barracks. For administrative purposes the 27th Brigade was attached to British 11th Armoured Division. 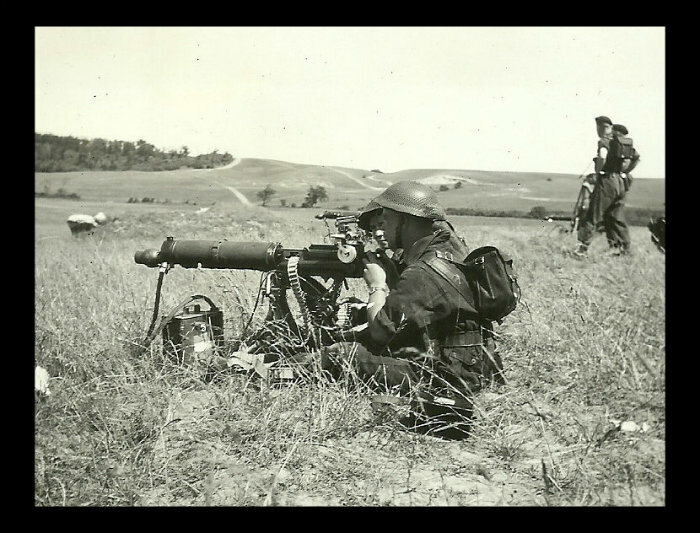 part of the British Army on the Rhine." 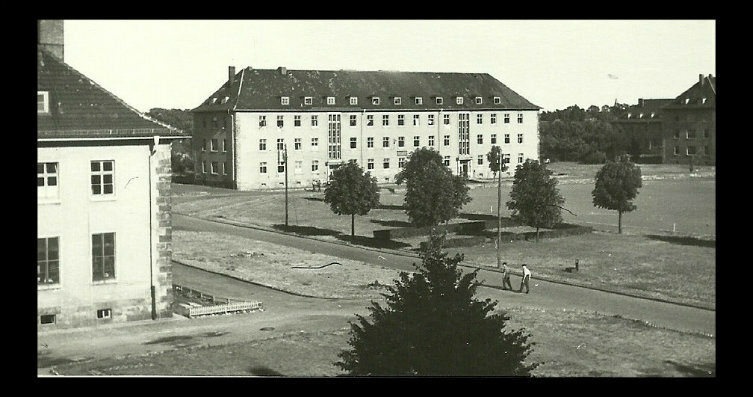 The name for this former German Kasserne remains elusive as it has been variously described as a former transit camp, an officers school, a Luftwaffe base, and now an artillery base. Additionally, during my posting with the RHLI (1CRB). the other Battalion in Edinburgh/London Barracks was 1CIB (ICdn Inf Bn). 1CHB (1 Cdn Highland Bn) was quartered at Chatham Barracks in the GHA.